[CLOSED] Euro Jackpot contest #31 - win 1 to 32 SBI and receive a part of the @steem-bounty!!! With yesterday's draw, I could announce two winners - CONGRATS! Thanks to @psionic-tremors to choose this week's numbers. choose one or more numbers of my ticket. 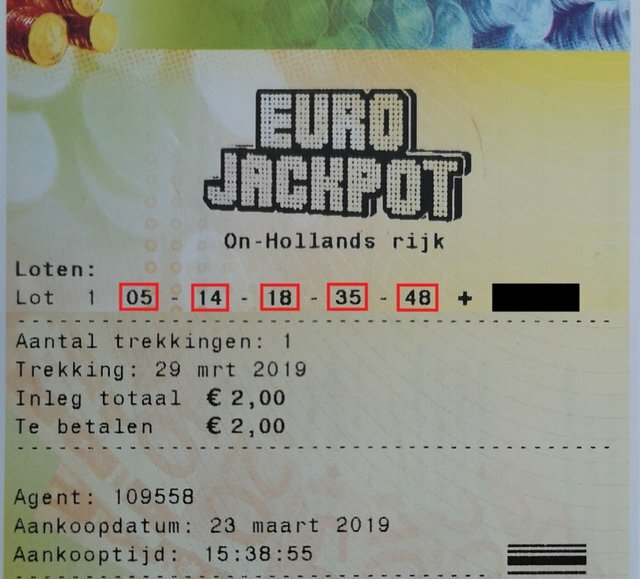 Add a number between 1 and 50 that is NOT on my ticket. Comments/edits made after Friday 29th of March 2019 at 7 PM CET (6 PM UTC) will not participate in the contest. @pundito has set 2.100 STEEM bounty on this post! Thank you and good luck again! Thanks for your support again and good luck!!! Thanks and good luck again!!! Good luck to you, too!!! Now you're only playing with number 14. Thanks for your support and good luck!!! Good luck again and thanks for the support! thanks for participating and your support! Actually, you should edit your entry before Friday 29th of March 2019 at 7 PM CET (6 PM UTC). Did you perhaps mean 18 and 33? That would be a valid entry. Your UA account score is currently 3.050 which ranks you at #10374 across all Steem accounts. Your rank has dropped 3 places in the last three days (old rank 10371). In our last Algorithmic Curation Round, consisting of 213 contributions, your post is ranked at #134. First transfer was before 47.42 days. Your ROI per day is 2.94 % and you are earning approx. 0.64 STEEM per day. Your ROI per day is 0.92 % and you are earning approx. 0.20 STEEM per day. 14 and 24 this week. Good luck @pundito! Thanks - good luck to you!!! Congratulations! This post has been upvoted from the communal account, @minnowsupport, by pundito from the Minnow Support Project. It's a witness project run by aggroed, ausbitbank, teamsteem, someguy123, neoxian, followbtcnews, and netuoso. The goal is to help Steemit grow by supporting Minnows. Please find us at the Peace, Abundance, and Liberty Network (PALnet) Discord Channel. It's a completely public and open space to all members of the Steemit community who voluntarily choose to be there. 14 and 42 :) - good luck everyone!! Thanks, psio - good luck to you, too!!! Thanks for participating and good luck again! Good luck and thanks a lot!! !